Enter sample shipment IDs ECI9328, ECI2337 or ECI4593 into the Shipment ID search field below on the map. Public tracking screen can be integrated with transport providers web-site? yes, you can integrate your tracking screen to your current public website either by linking or imbedding (f.ex. iframe) -your webmaster knows how to do. Tracking can be queried from anywhere? Tracking can be queried from any internet connected device, desktop/ laptop, smartphone or tablet iPhone/iPad, Android or Windows/Surface. Which shipments are tracked from my public tracking page? Shipments with prefix as setup by you are tracked from your public page, provided the truck driver has initiated tracking. What does truck driver need? Truck driver need to bring his Android SmartPhone with GPS switched on, and internet connectivity/3G data plan, for delivery of tracking data while driving. What should truck driver do? 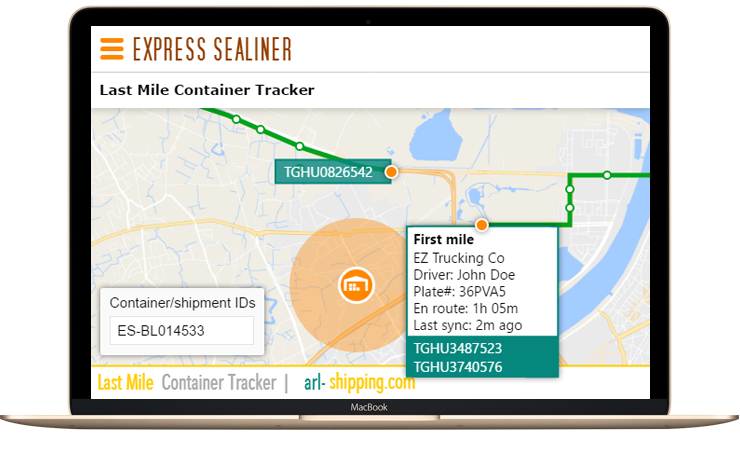 Download the arl-shipping.com "Last Mile Container Tracker" from Google Play, install and update his name, plate number and company in his profile. 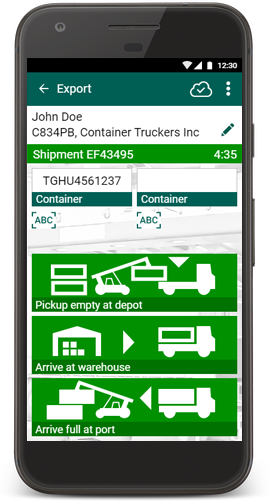 For each shipment to be tracked, initiate tracking when moving towards container pick-up location by entering shipment id, container number(s) (typed or scan/OCR), and click on milestone icons (container picked up, departing warehouse etc) as they occur. How does the truck driver know which shipments to track? Request shipment tracking via Last Mile Container Tracker, when requesting dispatch. Only pay a (low) monthly subscription fee depending on the amount of features required. All prices include support, hosting, trucker's smartphone app, cloud software, maintenance and occasional feature upgrades. Billing based number of trackings? Costing is based on monthly number of transports (not specific use of the Last Mile Container Tracking app). Subscription is valid for a transport provider with up to 1,000 monthly shipments within a circle of 400 kilometers. 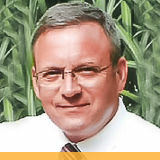 What are the costs for truck driver's data exchange? 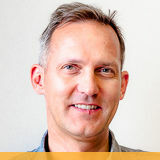 The data traffic has been minimised safeguarding the possible costs added to the truck drivers smartphone data scheme. Even for a chargeable data exchange scheme, multi-hour tracking will only result in a few Euro-cents costs. No maps are downloaded to the truck driver's phone. What if the truck driver works for other transport providers? Truck driver can use Last Mile Container Tracker for multiple transport providers. The shipment tracking is linked to individual transport providers via the shipment prefix.